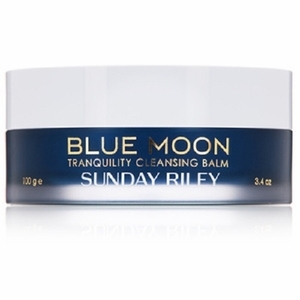 Skincare Solutions Store: We're Over the Moon for Sunday Riley BLUE MOON Tranquility Cleansing Balm! We're Over the Moon for Sunday Riley BLUE MOON Tranquility Cleansing Balm! Over the Moon for Sunday Riley BLUE MOON! This must-try aqua blue cleanser starts out as a solid balm but quickly transforms to a liquid, milk-like consistency. The oil-infused formula lifts makeup and impurities and gently washes them away. Ideal for dry and oily skin alike, this gentle balm strips away all the daily dirt, grime, makeup and gunk without disrupting your skin's natural oils. Tested safe to use on eyes, it even removes stubborn waterproof formulas. *This cruelty-free product is vegan, gluten-free, and hypoallergenic. **Find this product at www.skincaresolutionsstore.com along with many other great skincare products!